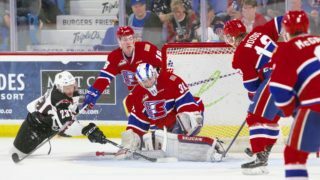 PORTLAND, Ore. – The Spokane Chiefs dropped their season-high fourth-straight game as a third period rally fell just short in Portland as the Winterhawks held off the Chiefs 5-4 Friday night. 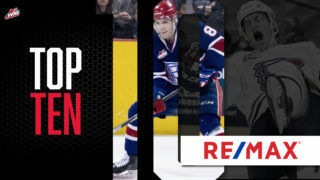 It was the Chiefs’ third consecutive one-goal loss to Portland this season and Spokane is now four points back of the Winterhawks for the eighth and final playoff spot in the Western Conference. Portland took a 1-0 lead on a Ryan Hughes power play goal 5:03 into the game. 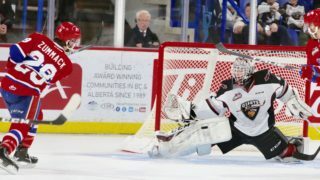 The Chiefs came back and tied the game at one as Ethan McIndoe scored an unassisted power play tally at 16:40, but the Winterhawks re-took the lead just 13 seconds later to take a 2-1 advantage to the second period. Portland outshot Spokane 13-4 in the first as both teams went 1-1 on the power play in the first 20 minutes. Portland would score three goals through midway of the second period to take a commanding 5-1 lead. 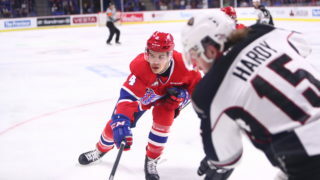 The Chiefs would get Kailer Yamamoto’s team leading 26th of the season at 18:06 to cut the margin to 5-2 after 40 minutes as each team put up 12 shots in the second. McIndoe would score his second of the night and 10th of the season at 11:54 of the third to bring the Chiefs within 5-3. 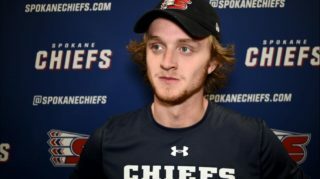 Defenseman Nolan Reid then fired home his first goal as a Chief and first of the season while the teams were on a 4-on-4 at 13:19 to put Spokane within 5-4. 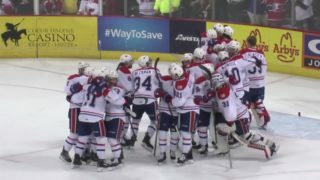 Spokane would pull their goalie in the final minute and a half, but would fail to score the tying goal, as Portland moved within a point of Seattle for third place in the U.S. Division. Spokane outshot Portland 16-8 in the third but were out shot 33-32 overall in the game. The Chiefs and Winterhawks will play again at the Memorial Coliseum Saturday night at 7:05 p.m. Mike Boyle will have the call on 790 KJRB-AM. The pre-game show will start at 6:30 p.m. Saturday’s game will also be on television, broadcasting live on SWX in the Spokane area, available on Comcast channel 112 or over-the-air channel 6.2.